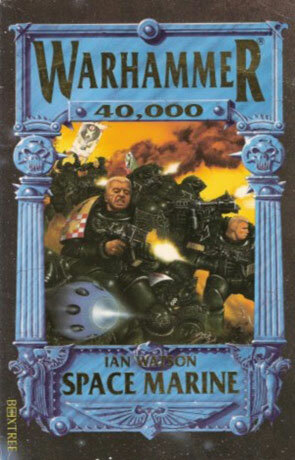 Space Marine is a rare novel that is set in the Warhammer 40k universe, written by Ian Watson. Space Marine is essentially a piece of history in the Warhammer 40k universe, but one that Games Workshop doesn't actually agree with, and was never re-printed. The novel itself no longer "fit's in" with the modern day interpretation of the Space Marines, but ironically is often considered to be one of the best novel's that depict the space marines to date. Ian Watson is an incredibly talented writer, having won many Science Fiction awards, was an ideas guy for Stanley Kubrick and helped Stephen Speilburg write the screenplay for the epic film A.I. The story begins on the Hive world Necromunda, where a young gang member, Lexandro raids the lower levels of the Hive-city, and encounters Biff, a member of a "scum" gang and Yeremi, a member of a tech gang. All 3 boys eventually choose (for thier own reasons) to volunteer to join a raid against a rebel hive-city with the Planetary Defence Force. They are quickly plucked from the ranks to join the Imperial Fist chapter of Space Marines. They are taken to the Imperial Fist stronghold for training, a ruthless process that results in mind wipes for major infactions, and torturous pain for minor ones (mainly using a "pain glove"). Eventually trained as full Space Marines, they then have to face the terror of a Tyranid invasion, the ultimate creators of the Genestealers. Space Marine is one of the first novels based upon the Warhammer 40k universe, published in 1993, and it is a very accurate representation of the Warhammer 40k universe at the time, before Games Workshop decided to re-write history a bit. As such it is a unique piece of history, one which I was lucky enough to buy new over 17 years ago. Written on 20th December 2009 by Ant.